UK owned Future Publishing has taken advantage of Apple’s Newsstand in a big way, earning $1 million since launching their digital titles such six weeks ago. Future Publishing currently offers 65 titles via Newsstand that service various verticals cycling and class rock to digital camera news and entertainment websites. The company’s new found success comes after six million titles were downloaded since the company’s newsstand launch on October 12. 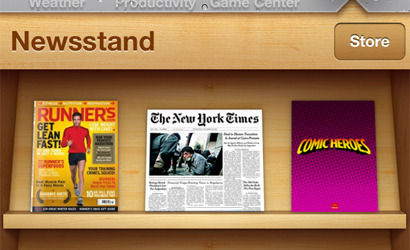 Using Newsstand users can tap a single icon on their iOS 5, iPhone and iPad home screens where they are taken to a magazine publication section where subscriptions can be purchased. Increasing Future PLC’s appeal has been their offer to provide free back issues to customers, those issues have been downloaded five million times. While customers can purchase individual editions the company says 40 percent of their customers are ordering subscription services which should serve the company’s growing internet subscribe base well. The platform will continue to be an important stepping stone for Future Publishing which recently reported a £19 loss as US print sales have slumped while digital print has increased by upwards of 25%. It’s our second biggest page turning, flat app. It has gone through the roof because it is a brand that means different things to a different device. And that means we will invest in the title in terms of IP, in terms of staffing, in terms of marketing, in a way that we previously probably wouldn’t have invested in to that extent. Is it going to revolutionise our business? It could do, it could well do. I think the next 12 months are gong to be very, very interesting indeed. Do you think services such as Apple’s Newsstand, AOL Editions and Flipboard are the future of subscription based publishers who follow the traditional magazine model?